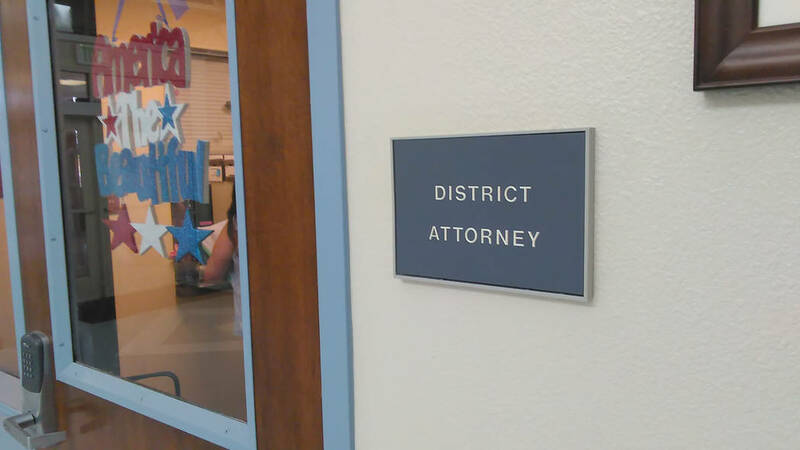 Selwyn Harris/Pahrump Valley Times A sign directs visitors to the Nye County District Attorney's Office in Pahrump. • Erick Oleb Dolmers-Sly was charged on Sept. 28, 2016 with unlawful use of a controlled substance, a felony; and headlamps required; driving without a valid license; possession of drug paraphernalia, two counts; unlawful possession of a hypodermic device, four counts; and possession of less than an ounce of marijuana, first offense, all misdemeanors. • Kurstee Kupfer-Jimenez was charged on Sept. 28, 2016 with unlawful use of a controlled substance, a felony. • Loretta M. Drouillard was charged on Dec. 30, 2016 with unlawful use of a controlled substance, a felony; and possession of drug paraphernalia and battery, both misdemeanors. • Marriah Eavonne Baldinger was charged on April 24 with child abuse or neglect, three counts, a felony. • Clint James Lucas was charged on May 30 with unlawful use of a controlled substance, a felony. • Michael Christopher Martin was charged on May 30 with child abuse and neglect, a felony. • Won Taek Lee was charged on June 6 with second-degree arson and third-degree arson, both felonies. • Sarah B. Gensaw was charged on June 6 with battery by a prisoner, two counts, a felony. • Joseph Christofer Chiarilli was charged on June 8 with burglary; obtaining money under false pretenses; offense involving stolen property; and habitual criminal, all felonies. • Eric Raymond Caldwell was charged on June 8 with burglary, two counts; grand larceny; and offense involving stolen property, all felonies. • Eric Wychunas was charged on June 6 with battery upon a protected person, two counts, a gross misdemeanor; and resisting public officer, a misdemeanor. • Corinne Faye Coronado was charged on April 27 with failure to obtain/maintain dogs and cats license, two counts; and animals running at large, four counts, all misdemeanors. • Michael Asa Hugh Coleman was charged on May 30 with domestic battery, a misdemeanor. • Jason Mitchell was charged on May 30 with harassment, a misdemeanor. • Richard Ramon Ramirez was charged on May 30 with disturbing the peace, a misdemeanor. • Eric Paul Moore was charged on June 6 with battery, a misdemeanor. • Sherry Stucky was charged on June 6 with battery, a misdemeanor. • Judith Marie Perkins was charged on June 6 with battery, a misdemeanor.